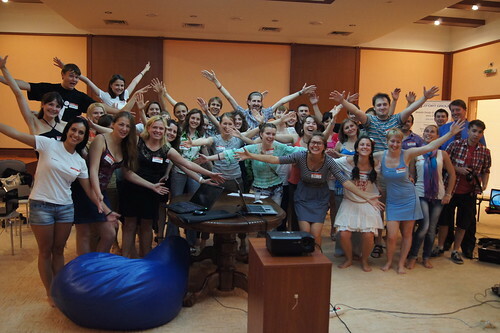 On June 15-16 the first Rails Girls in Ukraine took place in our office. This is an international movement (http://railsgirls.com/) that was held in Singapore, Shanghai, Tallinn, Berlin, Krakow and Amsterdam before. Apart from Kharkov, there were girls from Kiev. This event gathered more than 40 participants. Together with professional trainers they took a free two-day long course into exciting world of web applications development on Ruby on Rails. Official opening and acquaintance took place in the first day. On the second day from the early morning everybody gathered with combative mood, desire to learn and practice. The first half of the day was busy with educational seminars from trainers and after that the future programmers have been divided to groups which eventually began creation of their first application using Ruby on Rails. At the end of the day as judged by satisfied faces of the girls, it was easy to guess that the first Rails Girls in Kharkov has been successfully held. At the same time, similar events have been held in Buenos Aires and Paris. We communicated with each other using Twitter. Zfort Group – full scale IT Outsourcing Company.